Don’t we clean our homes every day? But we do understand that with all the dirt and dust accumulating on the roof of our home is tough to clean on a regular basis. Most households are unaware of the benefits of professional clean-up and restoration of roofs by roofing experts. And unfortunately, many others think it is way too expensive. Myth: Roof cleaning is a simple, do-it-yourself job. Cleaning a residential roof is no easy task, even on flat roofs. Up off the ground, it’s easy to lose your balance and fall, especially when a roof is slippery from water, and cleansers. Any activity that involves climbing a ladder onto your roof is not safe. In fact, falls are consistently the top cause of building-related injuries, according to several studies. Roof cleaning, repair, and maintenance jobs require well-trained expert roof replacement Houston professionals. Myth: Roof stains are caused by pollution, tar, or acid. Blue-green algae can be the cause of stains on your roof. These organisms feed on the limestone component of asphalt shingles and multiply quickly. Expert roofing contractors professional cleaning is required to rid your roof of algae. Myth: If your roof has algae stains, you need a total replacement. Not true at all, algae only grow on the surface of your roof and all it takes to remove them is a good professional cleaning service. Myth: Stains from algae actually add a rustic look to your roof. The sight of algae can never be rustic. You may have confused algae with patina that grows on copper roofs. While the latter certainly has aesthetic benefits, we can assure that the former is just a nuisance and doesn’t have any benefits at all. Myth: A pressure washer is the best way to clean your roof. Pressure washing is good for cleaning concrete, but not an appropriate method for roof cleaning. Most roofing materials are designed for exposure to rainwater, not the intense force of pressure washers. Pressure washing would strip your roof, shortening its service life and maybe even voiding your warranty. Instead, have your roof professionally cleaned. Proficient roofing contractors will use safe and cost-effective ways to get rid of algae from your roof. Myth: Chemical roof cleaners kill landscaping. This myth is partially true, as certain products like zinc strips have to installed in a specific way, else the runoff from your roof could harm your plants and could react with paints or finishes. Therefore, the best way to protect your landscape is to opt for professional clean-up. Professionals will make sure the installation/repair is handled with utmost care so that your plants or the ground does not come into contact with harmful chemicals. Myth: Roof cleaning is an unnecessary expense. Opting for professional cleaning by a professional residential re-roofing and cleaning specialist is an investment in preventive maintenance that can help keep your home in good shape and prevent more serious issues in the future. 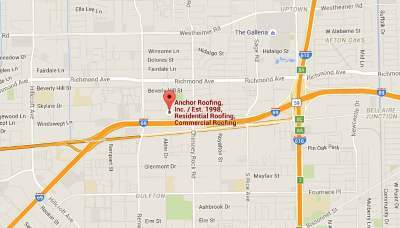 Anchor Roofing is the leading roofing contractor in installation, replacement, and repairing the roofing systems throughout the Houston, including Katy, Sugarland, Missouri, Pearland, Spring, Cypress, Galena Park, Richmond, and other neighboring areas. We can also assist you to choose the right roof for your home or work space. Contact us for all your roofing needs.